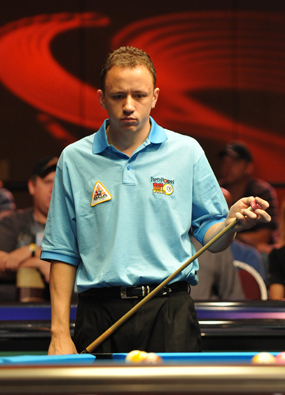 Van Boening was an early favorite among the 16 international stars. Give Barry Hearn credit. The silver-haired Matchroom Sport impresario has created fiercely loyal allegiance with the world's top players through consistency and innovation. And in the process, he's also become the sport's most prolific promoter and brand-builder. The World Pool Masters is actually the longest-running of Matchroom's pool events, having started in 1993 at Plymouth on England's southwest coast. (The Mosconi Cup will celebrate its 16th anniversary at the MGM Grand in Las Vegas in December.) And, just as interestingly, only one American has emerged victorious in the World Pool Masters. Matchroom favorite Earl Strickland won the 1997 title in the U.K., beating Irishman Tommy Donlon in the finale. In the 2009 World Masters at the Riviera Hotel & Casino, the Americans fared little better. American idol Shane Van Boening and still-lethal Johnny Archer represented the U.S., and both advanced to the second round of the single-elimination, race-to-8 event, but neither stuck around for the finale. Archer opened with a convincing 8-2 win over England's Imran Majid. Archer, who has played on the U.S. Mosconi Cup team 12 times, relished the win over former Team Europe participant Majid. "Any time Mosconi Cup players face each other, there's a little extra spark," admitted Archer, who had accused Majid of sharking at the Cup in 2006. Van Boening, meanwhile, faced the event's lone woman competitor, 21-year-old Korean sensation Yu Ram Cha. The former World Junior 10-Ball Champion and rising star on the Women's Professional Billiard Association Classic Tour held a brief 1-0 lead, but missing out on numerous opportunities afforded by the lackadaisical Van Boening, Cha never really threatened. Van Boening bagged the final five racks for an easy 8-3 win. Archer and Van Boening were joined in the quarterfinals by Filipino Dennis Orcollo (an easy 8-3 winner over Canadian Tyler Edey, a last-minute replacement for countryman Alain Martel, who was denied a visa) and a quintet of European challengers. The success of the Europeans would come as no surprise to anyone who has followed professional pool in recent years. In addition to their demolition of the U.S. in the Mosconi Cup, Europe's top stars earned all three recognized world titles in 2008 - Germany's Ralf Souquet winning the World 8-Ball Championship, Dutchman Neils Feijen winning the World Straight Pool Championship and Appleton's 10-ball title. (And with no 9-ball title contested in 2008, England's Daryl Peach remains the reigning World 9-Ball Champion.) And the only other pro title worthy of mention, the U.S. Open 9-Ball Championship, was, of course, won by Finland's Mika Immonen. In Las Vegas, Souquet, winner of an astonishing five World Pool Masters titles, coasted past 17-year-old Russian climber Ruslan Chinakhov. Whirlwind Tony Drago, winner of the 2003 World Masters and 2008 Predator 10-Ball Championship, cruised to an 8-3 win over error-prone Feijen, while Feijen's countryman van den Berg scored a surprisingly easy 8-2 win over defending champion Alex Pagulayan of the Philippines. Immonen needed a little help to win his opening match against China's Fu Jian Bo, who teamed with Li He-wen to win the 2007 World Cup of Pool. Deadlocked at 7-7, Fu botched a 5-6 combination, allowing Immonen to escape. Appleton, meanwhile, began a trend that he would follow right into the title match by dropping the first three games of his opening-round match against stylish former World Masters champion Raj Hundal of India. Still stinging from his loss to Dennis Hatch in an extended money match two days earlier, Appleton gathered himself and rolled off eight straight game wins for an 8-3 triumph. Appleton, notoriously hard on himself following losses, complained that he played "the worst pool of my life" against Hatch and needed the win over Hundal to restore his fragile sanity. "I was determined not to go out in the first match," said Appleton. "It was important to play well in the Masters." Appleton would need to do just that in his semifinal match against Souquet. Not only had the precision-driven German won five World Masters crowns, but Souquet was clearly the sport's most decorated player in 2008. Again, Appleton dug himself an early 3-0 hole, which should have been 4-0 had Souquet not botched an easy shot to open the rack. Appleton eventually evened the score, and the match was tied at 4-4, 5-5 and 6-6. Souquet was the first to reach the hill, but, with a chance to close out the match, the German scratched on the break. Appleton evened the score once more, then coaxed Souquet into a foul with a solid safety in the deciding rack. With cue ball in hand, Appleton sealed Souquet's fate and advanced to the semifinal. Van Boening kept the U.S. hopes alive with a solid 8-5 win over Malta's mercurial Drago, while Immonen coasted to an 8-4 win over Orcollo.